James Hilton (1900)...Book "Goodbye, Mr. Chips!" Whenever I’m discussing movies with friends and someone utters the expression, 'They don’t make ‘em like that anymore' my mind instantly turns to the classic film Goodbye, Mr. Chips. Can you imagine any screenwriter walking into a producers’ office in Hollywood today and trying to pitch the following plot for a film? An erudite young man named Charles Chipping (Robert Donat) has accepted a teaching position at a prestigious boy’s boarding school during the Victorian era. His passion and his optimism are vividly evident to his fellow colleagues and to his new pupils. Seizing upon his naiveté, the boys decide to mildly haze the first year instructor. Mr. Chips, as he will soon be christened, doesn’t understand why the boys are being disrespectful and chastises them accordingly. The strict discipline that he meters out to the class cast him as a harsh and cold authoritarian to the boys and they shun him in all non-classroom encounters. He spends the early years of his career in virtual isolation, not only from his students, but also from his fellow staff members who view him as aloof and dull. When the staid Mr. Chips accepts the invitation to holiday in Austria with one of the faculty, his life will be forever changed by the experience. While hiking alone in the Austrian Alps, he is stranded on the mountain for a few hours in an engulfing fog. 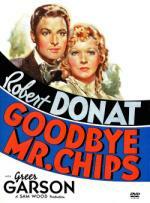 He chances upon a beautiful woman named Katherine (Greer Garson) who is also temporarily trapped on the mountain. While ‘Chips’ weighs in the severity of their situation, Katherine views it as more of a delightful diversion to her day. Katherine’s buoyant hopefulness completely mesmerizes Mr. Chips and he slowly realizes that he is in love with the vivacious young woman. The pair is rescued and after a rather elusive courtship the two are married. The warm side of Katherine’s character slowly thaws away the cold and frigid veneer that ‘Chips’ has built up over the years and slowly the staff and students begin to accept and appreciate the new and improved Mr. Chips. His blissful transformation will soon be tested as an unforeseen tragedy befalls Katherine and he is once again alone. Believing that fate has intended for theirs to be a short, yet meaningful affiliation, he throws the weight of his new found enthusiasm into molding the futures of his ever-changing classroom. Generations will come and go and the memory of his dry and dreary deportment will diminish with time, and he will come to be regarded as the true embodiment of the Brookings School for Boys. Goodbye, Mr. Chips is a testament to the bygone days of the golden age of filmmaking when a story meant more than the bottom line of gross ticket sales. It is the kind of film that is perfect for viewing on a cold rainy day when a warm and charming tale can help you to escape the stark reality of the times we now live in. This is where I am thankful for our unique television services in the UK. Normally the BBC can be relied upon to do decent dramas, but in 2002, ITV made a fair stab at the story with Martin Clunes. I can't remember much of it now, but I seem to remember they did it justice.